Miva Merchant e-Commerce Store Shopping Cart Development & Design | Los Angeles, San Fernando Valley | Webwest Internet Solutions Inc.
Miva Merchant 5.5 is a complete web browser based eCommerce Storefront and Content Management System providing all the tools you need to develop, maintain, and grow your online business. 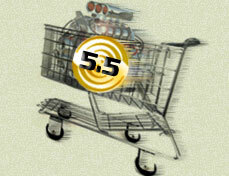 Miva Merchant 5.5 is a flexible, reliable, and expandable e-commerce solution with comprehensive features. It's ease of use is attractive to new online businesses while being powerful enough for demanding eCommerce experts. Miva Merchant eCommerce Shopping Cart Software features include complete store design control using Store Morph Technology™, advanced catalog, customer and order management systems as well as integrated credit card processing and shipping calculation. There are no limits on the number of products your store can hold and adding categories and products to a store is extremely easy to do. It's easy to sell online using Miva Merchant. Miva Merchant 5.5 has tons of great features. You'll have complete control over your store using Store Morph Technology™. Use the built-in design and administration tools to manage your content, inventory, customers, orders. Set up an affiliate system with the click of a button or create a complete wholesale side to your store with login required to view wholesale prices. Utilize the advanced catalog, customer and order management systems to develop, maintain, and grow a successful online store. These are only a few of the features included at no extra cost. More reasons why Miva Merchant is THE way to sell online. Trick out your Miva Merchant store by adding powerful extra features using inexpensive Custom Miva Modules. Custom 3rd party modules are available as add-ons so you don't have to call a programmer every time you need to add functionality to your store. 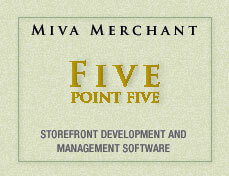 This cost effective customization element alone is a major advantage of using Miva Merchant 5.5. Since anyone who knows HTML can update the functionality of your store, you won't have to worry about your programmer disappearing and not knowing exactly how your store was coded. We've been in business for 24 years and in conjunction with LA Servers International, our Miva Merchant Web hosting company, have been a Miva Merchant partner since 2000. So you can rest assured that we KNOW Miva Merchant and Miva Merchant modules. And we're not going anywhere! Realize your company's business potential with a Miva Merchant 5.5 E-commerce Shopping Cart, the best and easiest to use browser based eCommerce Storefront and Content Management System for online business success.